I wanted to alert you to a few pieces of news from this end of the world. Hot off the presses! 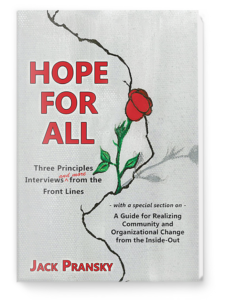 My new book, Hope for All: Three Principles Interviews and More from the Front Lines, has just been published. This book is actually a reissue of the best parts of my book, Prevention from the Inside-Out, which very few people ever read, understandably, as it is very large, complex and written more like a textbook and for those who worked in the field of prevention. However, for the general Three Principles community, I could not let the most fascinating and enlightening parts of that book die on the vine, primarily the extensive and detailed interviews with community people whose lives were completely changed and who, in turn, worked to turn around communities through applying Three Principles understanding. These interviews are different from the norm as they are much more extensive, and they are not to be missed. The other important part of this book is a special section on A Guide for Realizing Community and Organizational Change from the Inside-Out. I’m also proud to say that my 13-year-old granddaughter designed the cover. It can be ordered from Amazon.com, Barnes & Noble or any bookstore, or ordered directly from the publisher http://www.ccbpublishing.com/9781771433723.html. Hope for Allis an important part of any comprehensive set of essential books on the Principles. 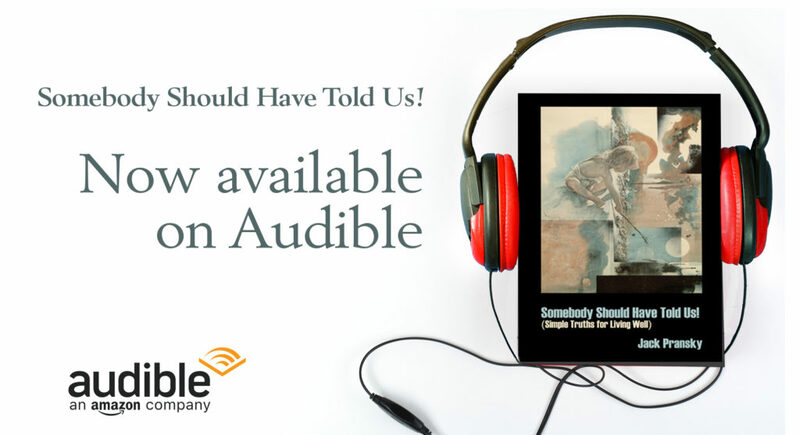 For those of you who do not yet know, I am also happy to report that my book, Somebody Should Have Told Us! is now available as an audiobook through Audible, narrated by myself. It took me a long time, but I finally got around to getting that done. It’s been getting excellent feedback. Gabriela Maldonado-Montano and I are beginning a webinar course in February called Simplifying the Art and Power of Coaching; Applying the Three Principles Most Effectively in Coaching where we examine what makes for effective coaching and use real life and real time examples of coaching happening in the moment, with feedback provided. For more information and to register, see https://jackandgabicoaching.eventbrite.com. For those in the U.S. who need to stay closer to home, on March 30-31 I will be conducting a weekend training in Denver on Deep Listening and the Power of Sharing the Principles. Those interested can email Pat McClory at pamcclory@hotmail.com. Thank you for taking some of your precious time to read this, and I hope to see you at one of these events or at least in my new book . In any case I wish you a Happy and prosperous New Year.